Music from my summers of 1986-7 while living on the Eastern Shore of Maryland. The idea behind the Anthropological Series is to capture what the DJ and those around her/him were listening to at the time, perhaps in a particular location or phase in life. RG had posted something about summer music on Facebook, and it reminded me that I had this mix in the works, so I put it together all formal-like. This mix includes some songs that I listened to during the summers of 1986 and 1987, when I lived on the Eastern Shore in Maryland. I worked at a local restaurant/bar/pool/marina complex there as a poolside cook, expediter, barback, dining room oyster shucker, and boat takeout delivery guy. 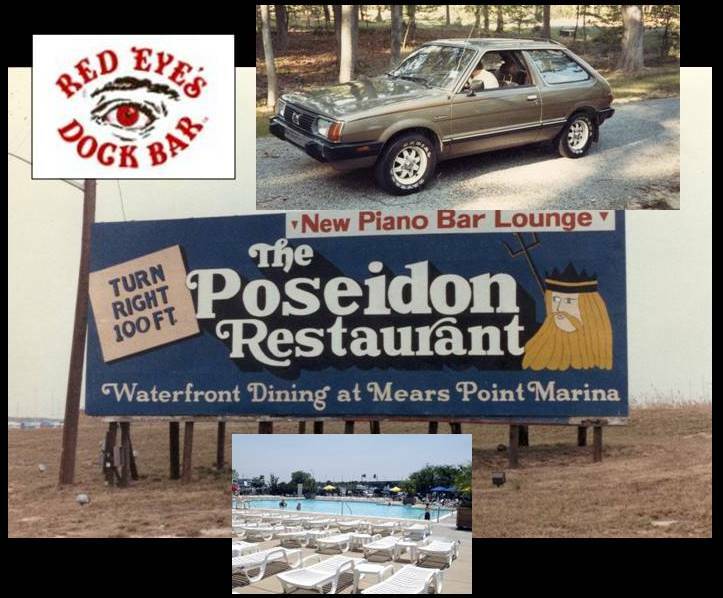 Once a month or so all the restaurant, marina, and bar staff would have a cookout/kegger at night at the pool and play music and water volleyball. I’d work 12-18 hour shifts Wed-Sat with a shorter Sunday, and hang out with bar staff Fridays and Saturdays after 2AM close. I drove my new used Subaru 4X4 hatchback to work, met lots of fun people, and wound up dating a fabulous lifeguard, much to my surprise. It was a great damn couple of summers! When I put this mix together I was surprised how strongly the music worm-holed me back to those days that I’d mostly put on the memory shelf. Naturally, the music will not do that for you. However, the other thing is that, as much as we all love new music, old music is still good. Sometimes I forget this. Then I find an old cassette or LP that I forgot about and play it and I’m blown away all over again. However, I’ve also made this “anthropological,” so it’s not scrubbed for just the cool songs I heard then. It also includes a few that just remind me of the time period that symbolize stuff you’d hear at parties or on the radio, things like “I Wanna Be a Cowboy” or “Lean on Me.” So when I first made this mix it was just for me, but then I thought about the music on it, and figured at least one other person would like it, so am posting it. Plus, with it being anthropological, I’m doing science a huge favor by capturing what a 19-year old was listening to in 1986. Musicologists living in their underground bunkers in 3056 will thank me. I don’t talk on it but threw in some movie and TV samples from the time. *On the Hunt – Lynyrd Skynyrd – There was a lot of Skynyrd around the Eastern Shore then, and I was listening a good bit to Nuthin’ Fancy and Skynyrd’s First and Last at the time as well. This reminds me of a dive bar called the Silver Dollar (I think), a place that, if you’d harnessed the misery there at the time, you could have powered a small town or maybe an amusement park. Planet of Women – ZZ Top – I know the old ZZ is the best and Fandango was one of my first cassettes, but I really dug Afterburner. I still love the whole release. I had picked up the cassette for whatever reason and ended up playing it till it broke by the end of the summer of ’87. The Boy in the Bubble – Paul Simon – Of course the video for Call Me Al was hilarious, and I think I got this LP as one of my Columbia House 9 LPs for a penny thing. I ended up really liking this song. I Believe – REM – I was hooked on REM when I first heard Chronic Town, and didn’t slow down until Green. Back then they were underground alternative, and those early 5 or 6 releases were just insane. I Wanna Be a Cowboy – Boys Don’t Cry – I first heard it at some party I went to. I picked it up on 45 an it’s just sort of stuck with me. **Light of Day – Joan Jett & The Blackhearts – Don’t remember much from the movie, but hell, Michael J. Fox and Joan Jett, I mean, c’mon! I picked up this 45 back then and it’s not a bad little song. Nice Boys – Rose Tattoo – I bought this cassette used at college in North Carolina in spring of 1985, and played the hell out of it. It busted too. ***Secret Agent Man – Johnny Rivers – I barbacked at Redeye’s lounge when it was part of the restaurant, before it was a huge outside dock bar. The bar was packed three deep in this tiny room, where, nearly every weekend, the same band played. This was the only song I could remember that they played because I always thought the guitar part was the highlight of their set. Red Rain – Peter Gabriel – Another Columbia House selection that really had some great songs on it. Stand By Me – Ben E. King – Stephen King’s story The Body was summer reading in his book Different Seasons, and this story was made into Stand By Me, a film for which this original song was re-released in 1986, so it was on the radio a lot. One of the all-time greats. Welcome to the Boomtown – David & David – Anyone alive with ears in 1987 remembers this song, just because it was always on the radio and was pretty different from everything else you heard. One hit wonders, but not a bad tune. Like a Song… – U2 – Had heard it before but acquired the War cassette and listened to it much more during this time period, along with insanely good Wide Awake in America live EP. Lean on Me – Club Nouveau – This is one of those mid-80s songs that you just couldn’t escape as that dance mix craze was ramping up. Somehow, I can tolerate it and actually enjoy it. It’s Tricky – Run DMC – What can you say? Sure, we’ve all heard it, but it’s still a blockbuster. ****I’m Goin’ Down – Bruce Springsteen – Born in the USA is a great album, and though I’d been hearing it for years, there were a few songs that I really liked, as they applied to my life in one way or another at the time. This is one of those. Learn How to Live – Billy Squire – I like Billy Squire dammit. Emotions in Motion is an excellent LP, and this is one of my favorites off that one that you don’t hear much. Don’t Care / Live Fast Die Young – Circle Jerks – I got turned on to the Circle Jerks and other punk in college, and this is one of the few punk cassettes I owned that I could listen to when away from college. Fire Still Burns – Twisted Sister – Ah, the death of early phase metal. The only band that stayed true through the 80s was Motorhead, and perhaps Maiden and Accept. The rest of my metal icons got lost along the way, and Twisted Sister was one of the brightest burnouts of all them. Come out and Play was a horrifically bad release. I bought it thinking it would be good, and it was just a huge let down. This was the only song of any merit on the whole thing. Metallica had been on my radar since Kill ‘Em All in ’84, and Accept’s Metal Heart had come out and was good along with Motorhead’s Orgasmatron, but really, for me, I was about to take a metal break for a few years. ***Jay Leno on David Letterman. This is when Letterman was new and good and everyone watched it. Leno was funny in the mid 80s, regardless of his status today. Yepper, so I took 6 days last month to head down to a free place to stay in Lake Tahoe NV/CA, and spent 4 of the 6 days driving through parts of northern CA into the Sierras, and out into central-western Nevada. Driving out west, or pretty much anyplace new, for me, removes most of the worries and responsibilities from my head for a short time. Out west, I tend to get a weightless feeling, which, after a few days, makes me want to buy an old 4×4 and some camping equipment and drive up into the hills for about a month, grow a beard, eat wild game and berries, and shoot at things with a rifle. Maybe next year.